This user guide is for the Metatrader candlestick detector. Load Metatrader and place the indicator onto the required chart. To do this either drag the icon from the navigator or click the icon. The input settings box will appear. The indicator will need activating by following the instructions here. To choose the pattern type, use the selector drop down box in the settings panel. The indicator will scan the chart for the chosen candlestick patterns. Each pattern is marked with an arrow and a label. The arrow indicates if the pattern type is considered bullish, bearish or neutral. Important: This refers to the candlestick pattern type rather than the specific instance located on the chart. Individual patterns may have a different interpretation to the type depending on the context. The indicator will scan the entire chart. For lower timeframes, this may involve processing large amounts of data. The number of candlesticks displayed in your charts (and processed by indicators) can be limited from the Metatrader settings box (CTRL+O) under the Chart tab. Important: If the chart symbol changes, open the settings box again and click Ok. This will ensure all of the new chart data is recalculated and the results updated. The licensed version of the indicator has the option to display breakout probabilities each time a pattern is detected and for the entire chart. To display the probabilities, choose the appropriate setting in the input panel (see Figure 2). On recalculating the indicator will then display the running breakout probabilities next to each pattern as shown on Figure 3. This means, based on the analysis of this pattern, the probability of an upside break is p% and the probability of a downside break is 1-p%. This analysis considers the breakout direction probability over the next N bars immediately following from where the pattern was detected. The default value for N is 30 bars. This can be adjusted in the settings box. This setting should be according to the expected duration of the trade. The probabilities are dynamic and as more patterns are analyzed, the probability scores will be adjusted at later time points in the chart. The indicator will generate probability data for the entire chart and display it in the Expert’s journal. The table below shows an example for the Harami. This means 252 candlestick patterns were detected in this chart. Of those 113 were bullish, 118 were bearish, and 1 was not classified. Bullish patterns had a 60.15% chance of developing into an upward breakout and a 39.85% chance of leading to a downside breakout. 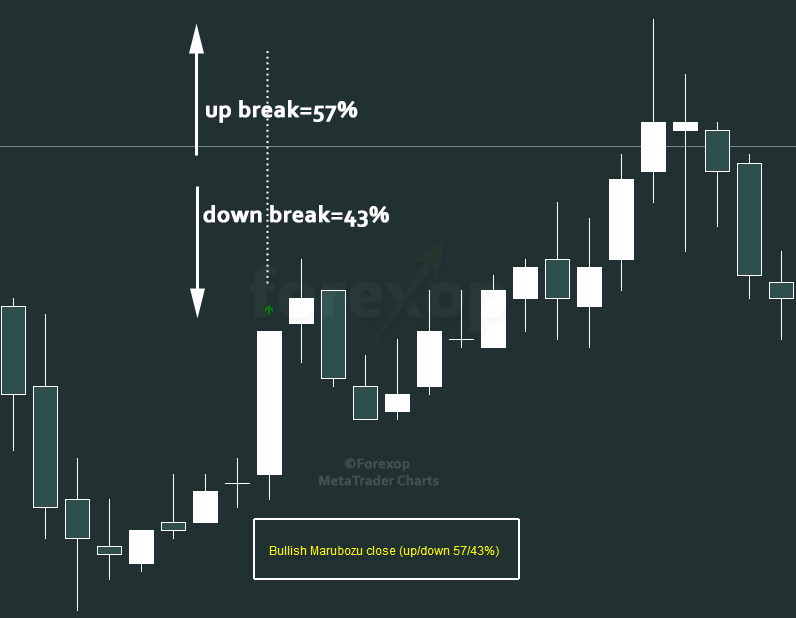 Bearish patterns had a 44.07% chance of developing into an upward breakout and a 55.93% chance of developing into a downside breakout. This table is based on the analysis of the entire chart. Individual patterns will have different breakout probabilities. Return to the indicator page.